In the very south of South Australia, at the bottom of the Eyre Peninsula, we spent a couple of days in Port Lincoln. The climate there is a so-called Mediterranean climate, so rain falls in the winter and the summers are very hot and dry. We were astounded at how green everything was after the severe drought conditions further north in South Australia and in New South Wales. This doesn't mean drought doesn't occur here; it does, but at the time of our visit, the countryside was looking lush, with huge paddocks- broadacre farming at its broadest -given over to crops. 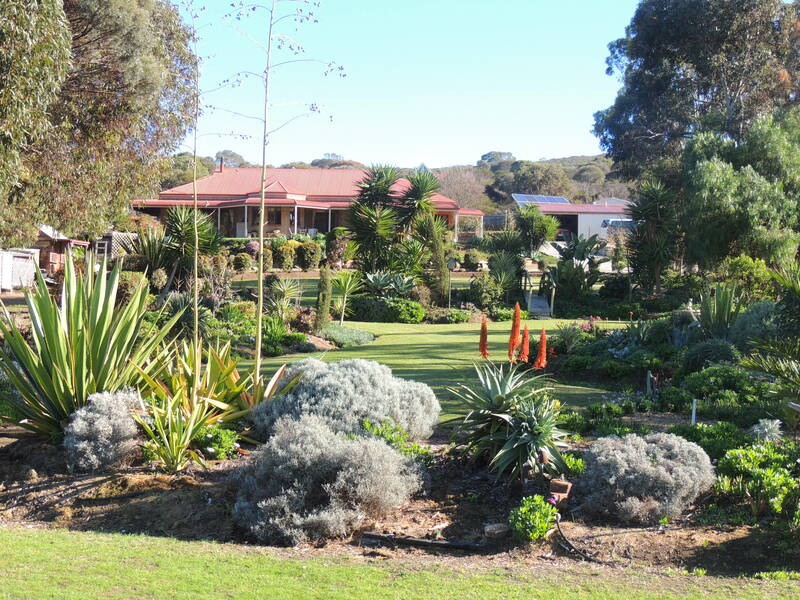 On a day trip to Coffin Bay, and anticipating the seafood platter that would await us there, we came to a sudden halt at the sight of this delightful private garden. Now this garden obviously belongs to people who are completely in tune with their climate. No frilly unsuitable flowers for them. Don't misunderstand me, I'm all for frilly and unsuitable and fall into that trap frequently, but these gardeners must have a plan and appear to have followed it unwaveringly. Not only are the plants carefully chosen, but the garden is beautifully shaped into sinuous curves and garden rooms. Judging by some of the plants that can be seen, including what is, perhaps a banana palm towards the back, I'm guessing that frost isn't a serious problem in this area. The red agave makes a wonderful strong statement, as do the grey leafed cotyledons, and santolinas- or are they artemisia? It wasn't easy to tell from a distance. There is an interesting variety of heights and shapes from ground covers to trees. We stood, hoping we didn't look suspicious, and admired the beauty of this garden for a short time before resuming our journey. There's a lot to recommend the idea of planting entirely to suit the climate of your garden. Is that what you do? Or are you like I am sometimes, trying to grow something when you know deep down, that you're doomed to failure. Nice to see this lovely Aussie garden! Thanks Jane! Thanks Liz, I very much enjoyed seeing it myself. Lovely garden indeed. We get strong frosts here in Bowral’s NSW. Even so, we took a banana palm with us when we moved here. It gets severe beating from the frost and Helvi cut off most of its frost bitten leaves. Each summer it courageously jumps up again and by late autumn is back to its former glory. Amazing how nature fights to survives. Yes, you’d get heavy frost where you are Gerard, and I’m amazed you can grow a banana palm there. Do you ever get fruit on it? Jane, I am a serious case of “Zonal denial”! I love the gardens from temperate-cool regions like England or Germany, I’ve tried many times to force myself to re-think my gardening practices and accept where my garden actually is: A Subtropical humid area. This dilemma has engulfed my life as gardener, It’s a trap and I can’t snap out of it or maybe I don’t want to… I yearn for absolute lushness, greenness, Peonies, Lupins, english Roses, Hellebors, Clematis and Tulips!.. I don’t want Frangipanis, Hibiscus and palm trees! If I could move to a cooler region I’d do it in an eyeblink! Oh, Marcelo, I know about your love of temperate flowers, and you do grow the most gorgeous roses. Well, it’s good to have some challenges in life, isn’t it! I’ve bought some seeds (Lisianthus)recently which will be a challenge. 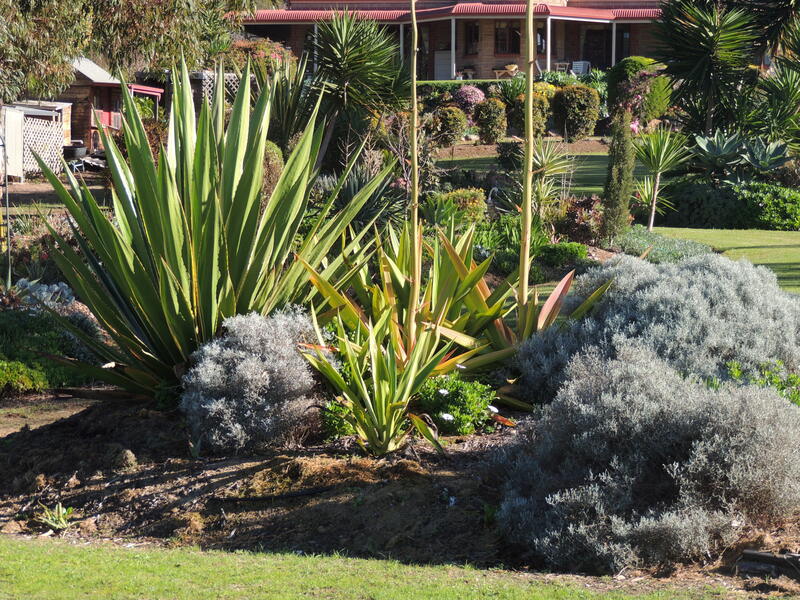 I thought that South Australian garden was pretty lush even though it was planted with climate-appropriate plants. That could easily be a garden in coastal Southern California! We too have a Mediterranean climate and my own planting schemes have moved further and further in the direction of plants suitable to this climate, both California natives and adapted plants from other Mediterranean regions. That said, there are plants like Dahlias that I just haven’t wanted to give up – I’m trying to confine those to the limited space of my cutting garden, however, where I water with more abandon. I think your garden is a perfect example of well-chosen plantings, Kris. Most things I grow are reasonably to very hardy, but I have succumbed to dahlias also, and to tulips and a few other things. A cutting garden is a great idea, and I’ve been giving some serious thought to adapting one of my vegetable gardens to that end. Yes, you said it first! Could be in San Diego, where I lived for many years. When I first gardened there I tried to grow plants from many different climates, but the ones which were poorly adapted (acid lovers in particular) never did well and were a lot of trouble. 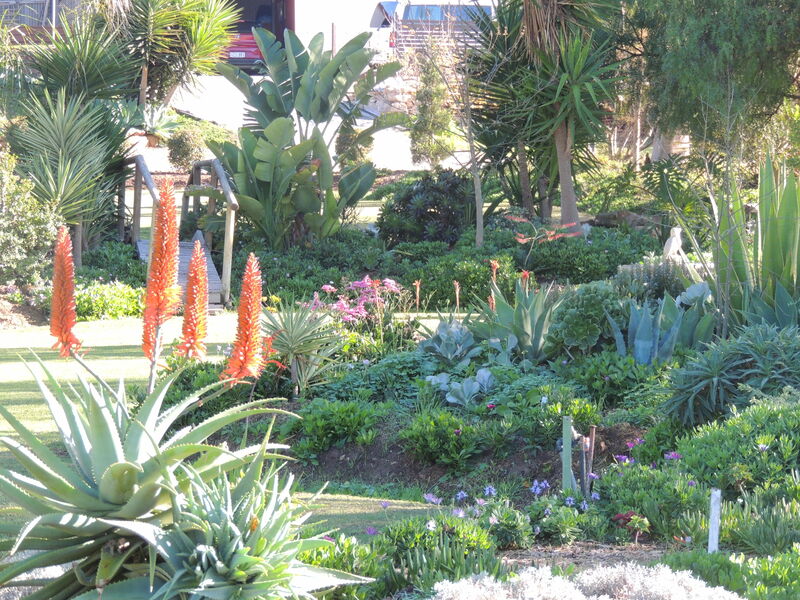 I eventually transitioned into all California natives and the garden was beautiful and healthy. I now garden in Provence, which is similar, but hotter and colder than San Diego. The soil is alkaline here too, so acid lovers are difficult. We inherited a few and have placed them near oaks and pines where there is shade and more acidity in the soil, and they seem to be okay, if not spectacular. I live in Canberra, and it took us a few years to adapt from the Sydney climate, where almost everything seems to grow! Our harsh winters and just as difficult summers means we are really looking at planting mainly Mediterranean plants in an area of the garden that we are re-doing. Your blog is very interesting, and I guess your climate in Mudgee must be similar to ours? That’s so true, Pauline. I keep looking at all those gorgeous UK gardens and wondering if I could find a spot to put some of the lovely flowers I’ve seen! My husband is all in favour of the ‘garden plan’, Jane, which is understandable as he is the poor bunny that ends up transplanting our plants when they don’t thrive. We don’t seem to be able to get our act together. I wonder if that is because, quite naturally, “stuff happens”. We had three lovely shade trees that we lost recently for various reasons out of our control. So the micro-climate in that area has changed dramatically. I think an annual review of the plan is good, with Spring not too far away, now is probably a good time for us to do that. 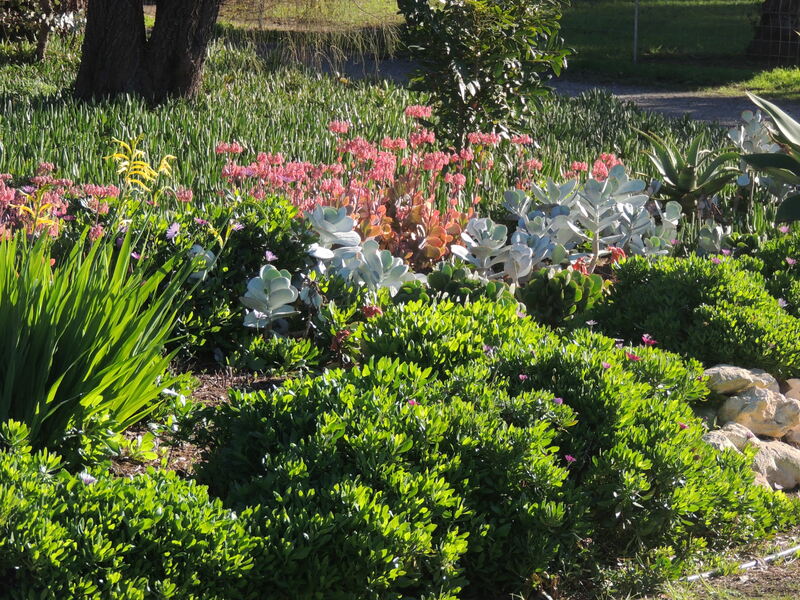 Perhaps there is a lot more going on in that SA Australian garden than meets the eye? A garden plan is a great idea, I just wish I was sensible enough to make one in the first place! I tend to plant and hope for the best, or worse still, go to a nursery, buy something and then wonder where I’ll put it. Yes, Jane, it certainly looked magnificent. When I lived in Ballarat my wife made sure she planted according the climate. But she also worked on micro climates so she used a large stone wall that soaked up the heat and she was always very careful about windbreaks. Great plan, particularly the changes in elevation and the contrasting textures and colors of the foliage. Those red-orange aloes! Gorgeous. I think the banana palm (in the US we just call it a banana tree as it isn’t a palm) may be a giant bird of paradise (strelitzia) due to the arrangement of the leaves as they look in the photo. As you know from my previous comments and the one above in reply to Kris P, I try to use only very adapted plants and pay particular attention to soil/pH requirements. Its very difficult to change the pH as even if you add a lot of acid amendments, the soil reverts after a year or two. Going with the flow and finding “substitute” plants works better, and is quite entertaining, bit of detective work…..
You’re more sensible with planting than a lot of gardeners Bonnie, including me. I’m sometimes hankering after things which are a challenge, but that makes gardening even more interesting especially if I’m successful. Jackie does pay attention to our soil and climate, but still gets some surprises. We are in a much milder area than ever before, but are subject to destructive winds which require protective work when we know they are coming. Wind is a killer, isn’t it. August is a very windy month here, so if we’re lucky enough to get a bit of rain, the wind soon dries things out. Add rising temps as we head out of winter and its a destructive combination. Isn’t it funny how it goes. I have cool temperate and would swop it for sub tropical or tropical in an eyeblink! I tried, when we moved here, to have most of the planting matched to the climate. We get a huge amount of rain, all year round. Or at least, we did. And therein lies the rub. The climate is becoming increasingly unpredictable. This summer I’ve spent an inordinate amount of time running around watering all those moisture loving plants wilting under the heat! Jane, may I email you? I would like to pick your brains if I can. Yes, you’ve had a difficult time of it in the UK this year Jessica, and the climate is certainly all over the place. We are classified as having a temperate climate here, and when it rains sensibly we can grow all manner of plants. The issue is frequency of rain which seems to be becoming less and less, and it makes gardening a real lottery. We’ve had to water even our drought hardy plants when the summer temps reach their heights. I’m happy for you to email. I don’t know if you can see my email or if I need to send it to you…not completely au fait with the blogosphere yet! I am a sucker for an unsuitable plant! Sometimes I fall, sometimes I am rewarded. This is a beautiful garden, love the red spikes of agave. It’s very sensible to plant what you know will be successful but the temptation to try other beauties is often too great. I’m not planting anything new until we get some rain! I also have misjudged planting selected plants within my state . My state has several climates and what will develop well in the mountains will not always do well along our Southern Coast . Therefore I keep gardens in both areas and they each have different plants and different seasons in which they propagate well .